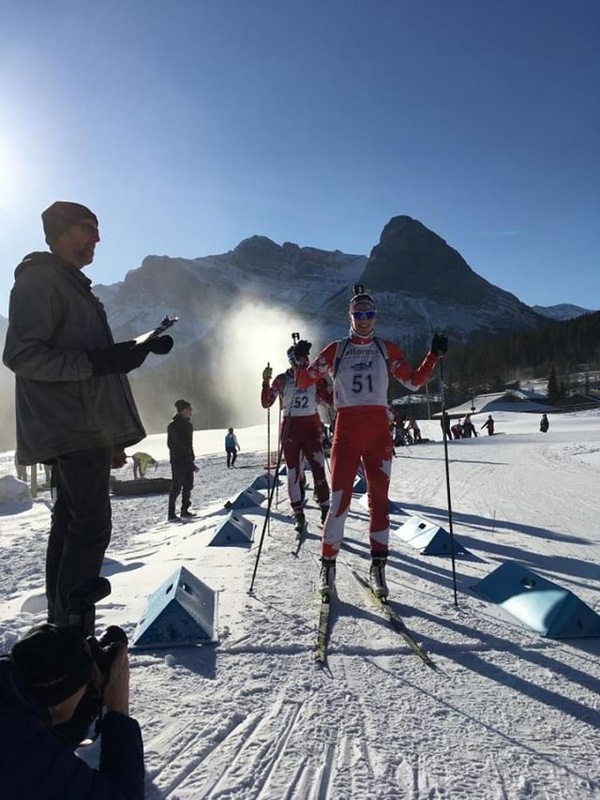 Thursday in Canmore, Alberta day two of Biathlon Canada’s selection trials featured a sprint, with the men racing a total of 10-kilometers, the women 7.5 k.
Nathan Smith of Canada’s Senior National team placed first for the men in a time of 24:02.7 minutes. Smith missed one shot prone and cleaned standing. Christian Gow, winner of the trial’s Tuesday sprint, placed a close second (+4.2). Gow missed a single shot shooting prone and shot clean during his standing stage. Aidan Millar (Team R.A.D.) skied to third (+35.7) after missing two shots — one each in prone and standing. With limited snow, the course is absent a penalty lap — male athletes were penalized 22 seconds per miss. Megan Tandy, also part of Canada’s Senior National Team, won the women’s sprint in 21:17.5 minutes after cleaning her prone stage and missing one shot standing. Tandy placed second in Tuesday’s sprint. Teammate Rosanna Crawford improved on Tuesday’s result, when she placed third, to take second (+5.7). Nadia Moser skiing for Biathlon Yukon, finished third (+21.2). Moser missed one shot in both prone and standing. The women were penalized 22 seconds for each missed shot. The selection trials will help determine Canada’s teams on the IBU World Cup, Ibu Cup and IBU Junior Cup for the first race period beginning the end of November. To date, only Scott Gow and Crawford pre-qualified for the 2018/2019 IBU World Cup.